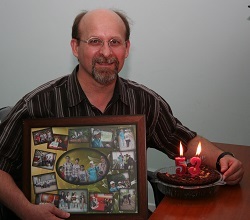 On July 18th I celebrated my 53rd birthday. I was very humbled and honored to have so many people expressing their well-wishes. One group of young people gave me a cake and a collage of pictures of them together with me and P. Another group invited us to lunch, and we were surprised with the number of people there, as well as the assortments of foods to sample. 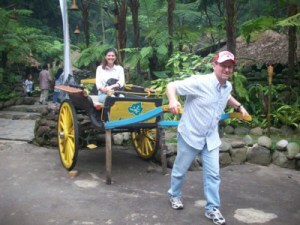 It was far more than just “Cake and Ice Cream” (like what is traditional in the USA). Veronica, Shawn, Y. (our local friend), P. & C.
From the 4th till the 10th of May we had the pleasure of a visit from C.’s brother and sister-in-law (Shawn & Veronica –owners of a 1,300 member fitness center in Houston, TX). 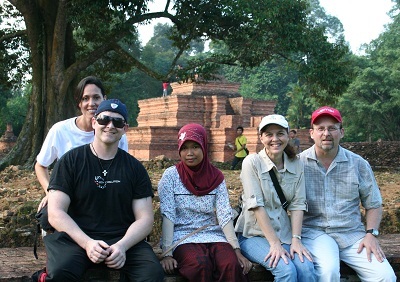 It was our first visitors in Indonesia in the 1 year and 6 months that we have been here. It was very hard to say good-bye to them, but it was better to suffer through the good-bye than to never have a visit at all! If anybody wants to visit us, let us know and we can arrange for you to be able to do something life-changing while here. If you don’t think your life won’t be changed, contact Shawn & Veronica, and they will let you know how their life will never be the same. They are now wanting to make a return visit in the future. No, we don’t live in a thatched roof hut. Actually, those homes are becoming rare. Even the most primitive of homes now have corrugated steel or tile roofs. There are a few thatched roofs out there, but they are becoming a thing of the past. 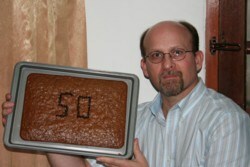 Yes, it was 50 years ago today that I came into this world, and I’m loving this maturing process! I’ve been waiting a long time to grow up, and now I’m finally starting to get somewhere. Feels Like 30 Instead of 50! The calendar tells me I’m 50 today, but it feels like I’m still 30. Maybe the effects of a mature physical body will begin to catch up with me in a few years. Until then, I may as well get as much out of it as I possibly can!